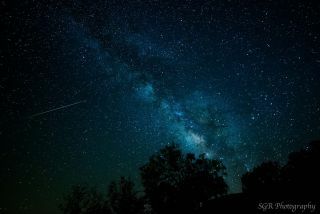 Astrophotographer Sergio Garcia Rill sent in a photo of an Eta Aquarid meteor and the center of our galaxy, the Milky Way, taken in Garner State Park, Texas, on May 5, 2013. A meteor shower made up of debris from the famed Halley's Comet will peak overnight tonight, but if Mother Nature spoils your show, don't fret. You can always watch it live online. The annual Eta Aquarid meteor shower will peak late tonight and before dawn on Tuesday (May 5 and 6), with NASA and the online Slooh community telescope offering live views of the "shooting stars" display. Learn why famous meteor showers like the Perseids and Leonids occur every year [See the Full Infographic Here]. This sky map from NASA depicts the origin the Eta Aquarid meteor shower in the constellation Aquarius in the night sky. The Eta Aquarids are left over material from Halley's Comet. The Slooh meteor shower webcast will begin at 9 p.m. EDT (0100 May 6 GMT). It will feature audio commentary from astronomer Bob Berman in addition to meteor shower views from North America. You can follow the Slooh webcast live directly at the Slooh website here, or via the Slooh iPad app. "What makes this shower somewhat special is that the meteors stem from the most famous comet in all of history, Comet Halley," Berman said in a statement. "As Halley goes around the sun in its 76-year orbit, pieces of it, little chunks of ice, slough off the comet and we intersect that every year around this time, in early May." NASA's Eta Aquarid meteor shower webcast will begin at nightfall and include live views from all-sky cameras at the agency's Marshall Space Flight Center in Huntsville, Alabama. "Currently skies are predicted to be clear over Huntsville that evening," Marshall officials wrote in an advisory. "The moon will be waxing crescent so there will be not much interference for early morning meteor observers," Cooke told Space.com in an email. "2014-2016 appears to be at the minimum, so I would not expect the [zenith hourly rate] on the peak night to be much above 40 per hour (maximum on a "good" year is over 80 per hour). However, we can always be surprised, and the good news is that the Eta Aquarid shower has a broad maximum, with the rates above 20 for a few days before/after the peak night." According to a NASA Marshall center advisory, the best time to see meteors will actually between midnight and sunrise, with the peak of the shower occurring between 3 a.m. and 5 a.m. your local time. The Eta Aquarids are one of two meteor showers created by Halley's Comet debris each year. In mid-October, the Earth passes through another stream of leftovers from the comet to create the annual Orionid meteor shower. Editor's note: If you have an amazing picture of an Eta Aquarid meteor, or any other night sky view, that you'd like to share for a possible story or image gallery, send photos, comments and your name and location to managing editor Tariq Malik at spacephotos@space.com.